The Environmental Club was founded in October of 1994 by Ms. Sharon Douglas and a small group of students. That year, when I joined as a freshman, the club consisted of only fifteen members and devoted most of it's efforts towards donating to charity. The following year, 1995, Mr. Anthony Thoman assumed the position of faculty advisor. The 1995 elections concluded with Eunshil Chung as Secretary, Karol Acosta as Treasurer, Tomasina Harper as Vice President. The new cabinet decided that the focus of our club should be the environmental issues in regard to our immediate environment. In an act of symbolism, the club scheduled a one day Clean-Up in the portion of the vacant lot that is located in front of our school. The lot, approximately nine acres in size, is in front of Kennedy's first floor entrance. It was approximately two feet deep in garbage and construction debris that had collected over the years. As the club continued a series of follow up clean-ups, dreams of a garden emerged amongst the students. 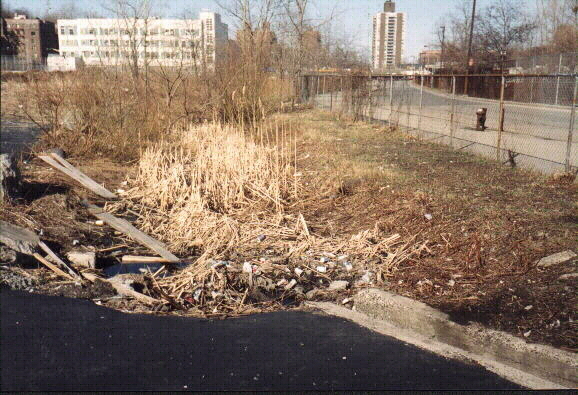 By spring, the club had removed over 500 trash bags full of garbage and debris from the lot. Mr. Thoman and the cabinet actually began to consider the possibility of creating a garden. Though teachers and students said that this would be impossible, we began to work towards our goal. As we were informed by our Principal, the land was not school property, but city owned land. 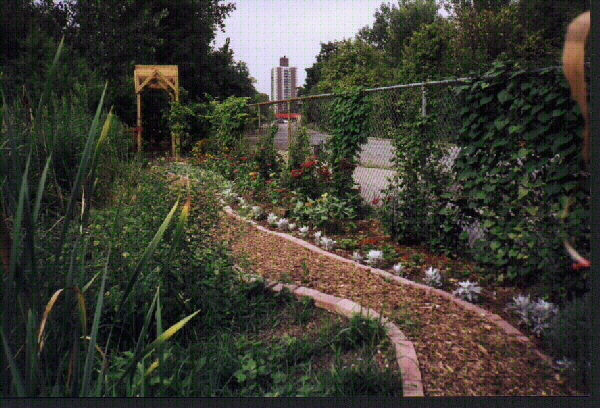 In order to begin a garden, we needed to obtain a lease from the city of New York. After a long political battle, with the assistance of Councilwoman June Eisland, and Assemblyman Jeoffrey Dinowitz, we were able to finally obtain the lease on the day of our first annual Earth Day celebration. The news added to the to the excitement as June Eisland arrived at our celebration and informed nearly 200 teachers and students of our victory. With all of the legal terms settled, representatives from Wave Hill, Green Thumb of New York Botanical Garden, and Bronx Green Up began to assist us in the formation of our garden. Green Thumb supplied materials such as seeds, lumber, and tools. By the end of that summer, we had established our own community Garden with a fence around the perimeter, beautiful winding paths, various plants and flowers and a rich wetland area full of cat tails. Throughout that summer David Mercado and John Nieves, two Kennedy students worked tirelessly almost everyday to initiate the garden. Their leadership and dedication laid the foundation for the successful garden that we have today. The following year, 1996, our large club of nearly 200 members elected a new cabinet. The new officers were: Engels Valenzuela as Earth Day Coordinator, Elizabeth Mercado as Secretary, Nareesa Mohammed as Treasurer, David Mercado as Garden Manager, John Nieves as Vice President..
With the garden established, the club focused most of its efforts towards maintaining and improving the garden. By Spring, we had added a 22 foot truss bridge, built by Kennedy's woodshop teacher Paul Witmer and his students. This bridge, now which spreads across our wetlands, is one of our highlights. This year, CEC International Partners, Inc. selected our high school to participate in an environmental student exchange in Russia, one of the only high school student exchange programs in the United States. This was a great victory for the Environmental Club because our efforts had a brand new image for Kennedy. Seven students and Mr. Thoman studied environmental issues in Saratov, Russia for three weeks. It has been amazing to see how our little dream of a garden has taken us half way across the globe. Our garden has brought a new meaning to the average school day at Kennedy. Years ago, students entered school with images of garbage and debris. Now the students see a blooming garden. We contend that the new environment that we have created has had a major impact on the attitudes of the students towards school. Now students can begin their day on a positive note as they enter the school. In essence, the garden has had a far greater impact on our school than what seem obvious. To us, our garden is a symbol of the product of hard work and determination: One which represents our growth and maturity as individuals. It has been the place that has united students under a common goal. Together, we have set all of our differences aside, we have disregarded our likes and dislikes, and together we have achieved this goal. Clearly the Environmental Club has been far more than just an after school activity to students. It has brought new meaning into the lives of many students and has affected every aspect of our school. We have learned that the purpose of an environmental organization doesn't necessarily mean that we have to focus our energies on an issue like the manufacturing of aerosol sprays, but that we can also influence the lives of people in our own community. By doing so, we are doing ourselves, and the future generation a great injustice. (President of the John F. Kennedy High School Environmental Club for the past three years).